A lack of knowledge in Ghana can get you thrown in jail or even killed. Such are the stakes when dealing with the food that people eat. “In Ghana a lot of vegetables are produced using wastewater,” explains Philip Amoah, leader of the Knowledge Sharing in Research Pilot Project. IWMI has been undertaking a number of projects that are trying to conduct research to come up with simple risk-reduction options that can be used on farms, at markets and at food preparation points to make food safer. The teams test various interventions from farm to fork to enhance food safety and the potential to institutionalize such interventions so they become common practice. The projects are then compiling techniques that can teach food growers, sellers and producers easy ways of improving food safety. Once these techniques have been devised the challenge is to ensure that as many people as possible hear about them and put them into practice. This is where knowledge sharing (KS) comes in. A grant from the CGIAR ICT-KM Program’s Knowledge Sharing in Research Project helped them to be able to explore and try out ways to take these results, make them easily understandable and useful and get them out to the stakeholders who need them. “We get the results from these projects, modify them in a way to make messages that the end–users will understand and then we come up with simple communication methods to get these messages out to those who are growing, selling and catering these vegetables which may be at risk,” says Philip. Knowledge sharing has been used in this project in two main ways. Knowledge sharing approaches were used to help the project, and its researchers, to interact and collaborate better with various stakeholders within the research process, to help to understand better the situation and needs, as well as to get feedback on project results and support in developing appropriate messages and communication mechanisms. “We started off with a series of World Cafes during the research project. The World Café is a methodology where you put people in a room together-in a café style setting, to try to make them as comfortable as possible to discuss with others, and get them to tackle certain key questions.” The World Café approach was used to facilitate an open discussion with key stakeholders on the messages develop by the project and the appropriateness, viability, constraints and effectiveness of these in achieving adoption of suggested innovations. With a greater focus on knowledge sharing, the Project also looked for more effective ways of getting the key messages out to the target groups. Radio was believed to be a perfect medium for communicating the findings to as wide as possible an audience and in various local languages spoken in Ghana. “We did radio programmes in local languages because radio is accessible in Ghana even for the farmers. Almost everyone has a small radio,” says Tonya Schuetz who has been also working on the project. The projects also produced a series of DVDs on safe food practices and presented these to farmers and householders, extension agents, as well as caterers too. Before beginning a concerted campaign of knowledge sharing in research, Philip says he sometimes had difficulty communicating even simple messages like the need for farmers to water crops at the root so as not to splash soil on to the leaves, causing a potential health hazard. “One time I was chased out of a vegetable growing site in Accra when I went to take water samples because at that time the farmers were not involved in the project,” he says. Tonya says it was not only farmers, but researchers, too, who changed their attitudes. Hopefully knowledge sharing will help us to save lives. As part of the efforts of the Knowledge Sharing in Research Pilot project “Safe Food despite wastewater irrigation: a knowledge sharing approach” lead by the International Water Management Institute(IWMI), an innovative knowledge sharing approach has been developed to help share appropriate knowledge generated by research projects working on wastewater with key stakeholders. Described as a ‘roadshow’ this knowledge sharing approach is designed to bring relevant stakeholders together to follow the contamination pathway from farm to fork to understand how the contamination occurs, what the health risks are, and then to look at and learn what practices could be used to reduce the contamination and health risks. Key in all of this is that all stakeholders from farmers, to market vendors to caterers to extension officers and policy makers observe , discuss and learn together. The overall objective is to improve the adoption potential by application of an knowledge sharing activity that brings together representatives of all involved groups along the contamination pathway in wastewater irrigated vegetable production. Ø discuss/ demonstrate identified health risk reduction options in a sequence along the contamination pathway. Ø show the correlations between the different levels of application of the health reducing methodologies, i.e. the accumulative effect or draw-backs in case of failure at individual stages. Ø create a platform for exchange of related questions, challenges on the adoption potential of the identified option with all groups involved. Ø see if the feeling of joint responsibility for the participating groups can be strengthened by knowledge sharing activities into research projects and thus the impact of our research. Ø monitor and evaluate the benefits of knowledge sharing activities into research projects. The roadshow is one of a variety of approaches that has been used. The roadshow approach was first used in Accra, Ghana by the project in November 2008-with resounding success. The other cities in Ghana where wastewater work has been done also wanted such an approach to be done there. So in March 2009 a roadshow was organised in Kumasi and Tamale Cities in Ghana. I had a chance to visit during the roadshow in Kumasi, so will be posting some updates, photos etc from this exciting event. A “Roadshow on health reduction along the contamination pathway” has been developed by the International Water Management Institute office in Ghana to use as a knowledge sharing approach for its work on wastewater. With funds from the ICT-KM Knowledge Sharing in Research project, the IWMI Wastewater Pilot Project developed this approach and first used it in Accra. With the success and popularity of this event in Accra it was decided to undertake a similar activity in Kumasi and Tamale-other major urban areas in the country where wastewater is also used in irrigating vegetables. The next event in line is the Roadshow to be held in Kumasi on the 5th March 2009. I will be participating in the event and will be reporting on it via this blog…so stay tuned! 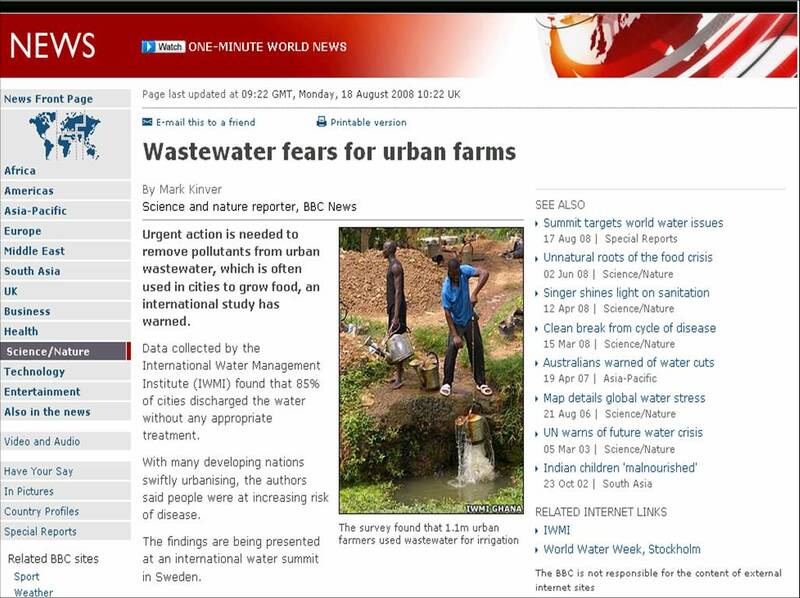 The International Water Management Institute(IWMI) has this week, at the Stockholm Water Week, released a report on a study they conducted based on “case studies from 53 cities in developing nations examining where wastewater was being generated, how much was being used in urban agriculture, and to what degree the water was being treated“[BBC website]. The study resulted in a number of interesting findings about both positive and negative effects of wastewater use in (urban) agriculture). This has been covered by a number of news agencies including the BBC website article. This study has also identified a number of practices which can help to alleviate the negative effects often incurred in wastewater use for farmers, caterers and others who are involved. What this highlights therefore is that research such as this generates valuable knowledge which is required for informing and changing behaviour, practices and policies. In order for the research to influence these things and have an impact it must consider and work on the necessary next steps to get these messages out and knowledge about such practices into the hands of those who are using wastewater or handling products which are derived from wastewater irrigated agriculture. This may involve working directly with farmers or others using wastewater but may also involve equipping other intervention agents, such as extension officers, NGOs etc, with the right information and tools to work with communities directly. How can we get key outcomes and impacts from this kind of research? Many of these efforts have been successful and efforts are continuing in trying to find ways which can better improve the impact of this valuable wastewater research. In response to an increasing demand for training in urban agriculture, Ryerson University’s Centre for Studies in Food Security and The Chang School are developing a portfolio of distance education courses on urban agriculture in partnership with ETC-Urban Agriculture and the international network of Resource Centres on Urban Agriculture and Food security (RUAF). See the flyer for more details on the courses. Training and awareness videos that have been developed and used through the support of the IWMI Wastewater KSinR Pilot project to outreach messages on good practices of wastewater use coming out of research projects to caterers, farmers and extension agents are to become resources for these Urban Agriculture courses. Information on the videos can be found at on the IWMI Wastewater training and awareness videos page. With the distance learning course targeting people from various organizations and areas of work, around the world, the videos will serve as a useful resource for information and recommendations derived from a set of research projects which have been working on the topic of wastewater in urban agriculture in West Africa. “The videos, initially designed to help achieve knowledge sharing with caterers, farmers and extension agents, will now achieve even more knowledge sharing with the various ‘students’ of the distance learning courses” highlighted Dr. Pay Drechsel, IWMI Theme Leader and Researcher on Wastewater. In sub-Saharan Africa, where wastewater treatment does not keep pace with city growth, the use of polluted water in irrigated vegetable production is very common. This puts urban dwellers at risk as these vegetables are part of the urban fast food. An number of entry points for health risk reduction are important, including safer irrigation practices as well as food safety and hygiene. 1. “Improving Food Safety in Africa-where vegetables are irrigated with polluted water. This is an awareness and training video for staff of street restaurants. This video tries to convey 8 basic rules for the food catering sector as identified in two projects carried out by IWMI through funding and support of the CGIAR Challenge Program on Water and Food. These give special attention to contaminated vegetables in the general frame of food safety. To keep the messages as realistic as possible the video applied the concept of ‘participatory video making’ in close collaboration with the street food catering services sector in Ghana. This video is in English with French subtitles available. Handouts with main messages in English and French are available and are to be given out to the audience to whom the video is being shown. This is an awareness and training video for extension officers and farmers. An important entry point for health risk reduction is the farm where safer farming and irrigation practices can reduce the initial crop contamination levels significantly. These videos have been used a number of training and other workshops.